2 posts in one day… I’m a wild woman! I’ve been meaning to write this post for a while, and I’ve had a few readers requesting these juicer recipes for a couple months now. Being my uber-productive self, I finished one of my deadlines early this afternoon (I believe Starbucks may have contributed), and what better study break is there than blogging? I know this blog is for “The Juice Junky” in all of us, but my new-found discovery of plant-based vegan recipes and holistic health practices can sometimes overshadow the juicing aspect you all come here for! 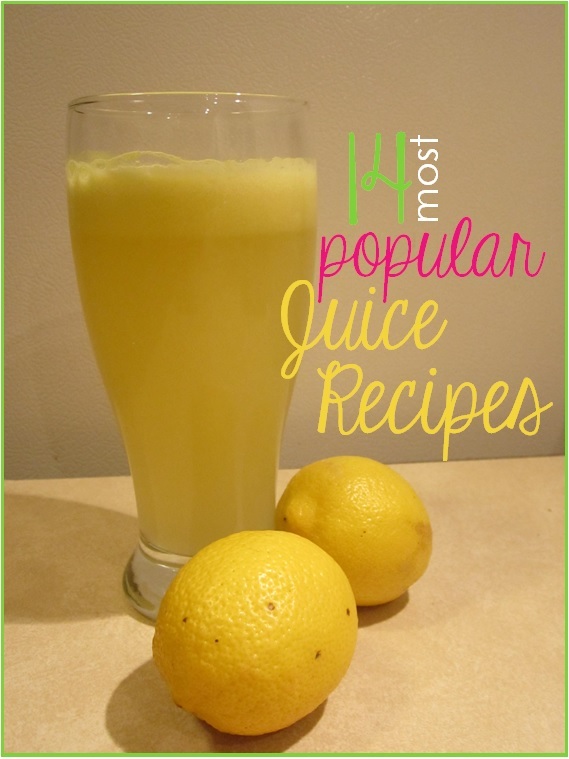 I have compiled a list of the 14 most popular juice recipes to share with you. Keep in mind, these are the most common recipes that I use myself, but there are obviously thousands of recipes that others may see as more popular than the ones listed here. Also to keep in mind for those new to the juicing practice, these recipes are only a guideline. Don’t be like “I have everything but the apple for this recipe so I guess I can’t make that one…” Feel free to mix and match! Once you get the hang of this crazy awesome world of juicing, you may move away from the recipes (I know I definitely have) and follow the general 80/20 rule while creating your own delicious concoctions! The 80/20 Rule: You are not only allowed to make up your own juice recipes, you are encouraged to! Like I said before, you may not have all the ingredients for a specific recipe, but that doesn’t mean you can’t sub out apples for oranges or cucumber for celery, or even just omit an ingredient altogether (I can’t handle juicing radishes, no matter how many times I try! I leave those suckers out of any recipe calling for them). This brings us to the 80/20 rule: When creating your own juice recipes, the general guideline is to make your creation ~80% vegetables (preferably greens!) and ~20% fruits. You can ALWAYS up the vegetable percentage! Fruit juice is okay in moderation (I mentioned making apple juice in my previous post), but it’s something that should be done as a “once-in-a-while-treat” basis. When fructose (fancy word for fruit sugar) is consumed without being coupled with fiber (fiber is removed during the juicing process) there is nothing from stopping the fructose from flooding the liver in one heavy hit. Eating an apple is okay, because the fiber combats the fructose and acts as a sort of “time-release” mechanism. Drinking apple juice, there is no fiber, so the digestive system is hit with all that fructose at once, which can be detrimental in high doses. I can go into detail on this in a later post if you’d like; just comment below and let me know! Okay, enough science junk. I’m the one in school, not you. Time for the yummy part of juicing! Without further ado, I give you my list of the 14 most popular juices in my kitchen! That’s one new juice a day for two weeks! Please share your juice recipes and experiments in the comment section below! When the liver detoxifies, it sends those toxins to the intestines with the intention of getting them out of the body. Many heavy metals going through this process end up being reabsorbed into the bloodstream repetitively. Cilantro binds to these metals in the body and carries them through the intestinal tract so they are excreted once and for all, and don’t get reabsorbed, or stay in risky places like the brain. JUST SHOOT IT! You will feel instantly invigorated; I promise! Shoot it even when you’re not sick. When your throat is sore though, this shot will coat it and you will feel improvement within minutes. When all else fails, there is this awesome infographic from CrazySexyJuice.com to help guide new juicers on their own juice-creation journey. Definitely check this website out; Kris Carr is amazing and she is a true inspiration to anyone looking to improve their health through nutrition. Again, please feel free to comment and tell me about your favorite juice concoctions and kitchen experiments! I started off my day right this morning with one EXTREMELY green juice! Celery, cucumbers, kale, spinach, lemon, ginger, and an apricot. Holy yum! I felt great and was ready to take on the day! No amount of juice could have prepared me for the weather though. The weather today has been absolutely insane. Most businesses in the area shut down around 3:00 due to a tornado warning AND a flash flood alert. The sky turned an eerie green almost instantaneously and torrential downpour stranded me as well as the rest of the city. Hail pelted relentlessly at my windows and I thought to myself “I had better cook some food while the power’s still on!” The only question was what to make? I don’t know about you all, but lately I seem to be on a Middle Eastern/Indian food kick. Curry powder, cumin, and paprika have been my go-to spice trio for the past few months (My Italian mother is not at all thrilled by my lack of basil, oregano, and thyme). 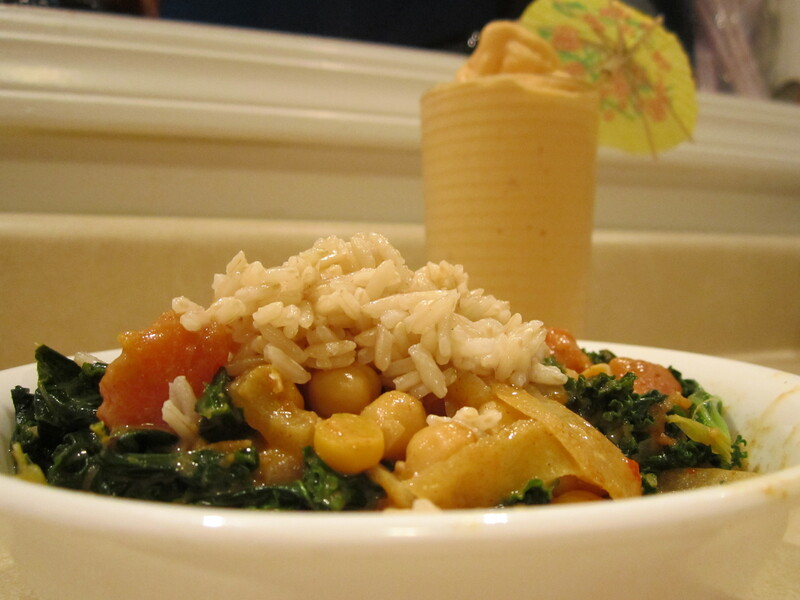 I ended up throwing together a kale and chickpea curry, served over a bed of brown rice, and what’s better to wash down that tastiness with than a mango-papaya smoothie? Enjoy both of these recipes. 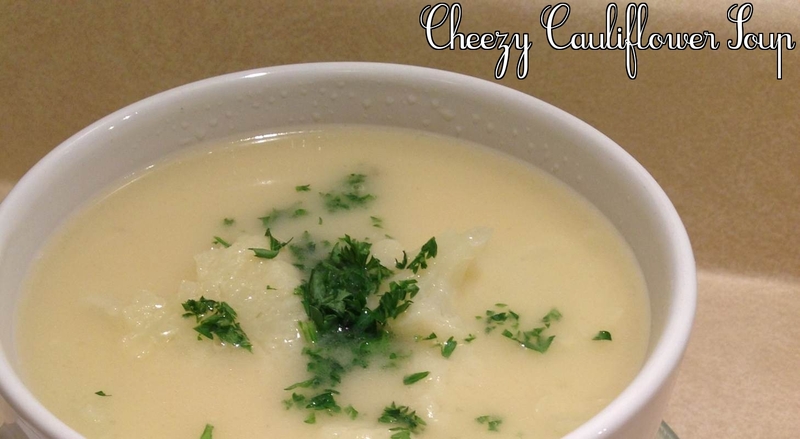 Whether you make them together or separate, they will taste amazing! Start cooking the rice while you work on the rest of the dish on another burner. Once your rice is simmering, pour the olive oil into a separate pan and cook the garlic and onion on medium heat for 5 minutes. Add in the tomatoes after the onions have become translucent, and add in your seasonings as well (curry paste, paprika, cumin, coriander). Let simmer for another 5 minutes. Then add your can of undrained chickpeas. The liquid should give the mixture a stew-like consistency. Simmer the mixture for 10-15 minutes. Right before taking the mixture off the heat, add the kale. Cook just until it wilts. 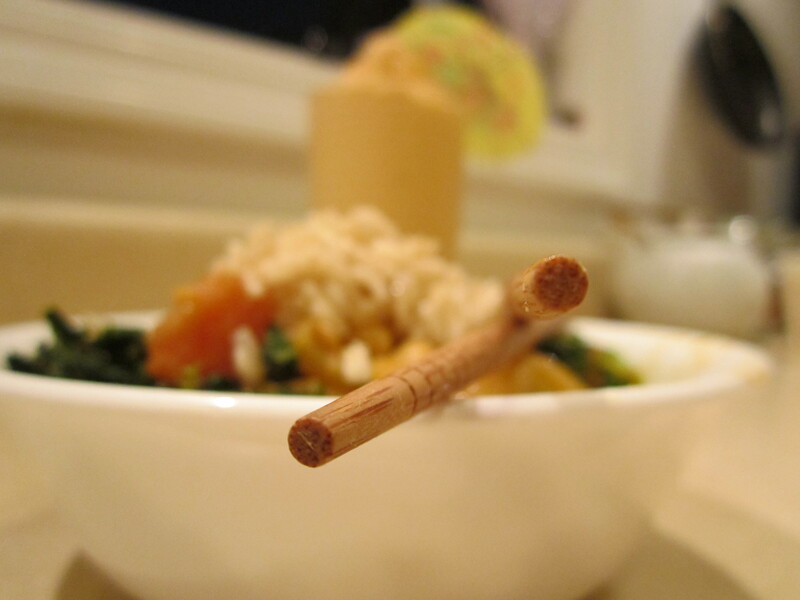 Serve over a bed of brown rice. Add coconut shavings for garnish. 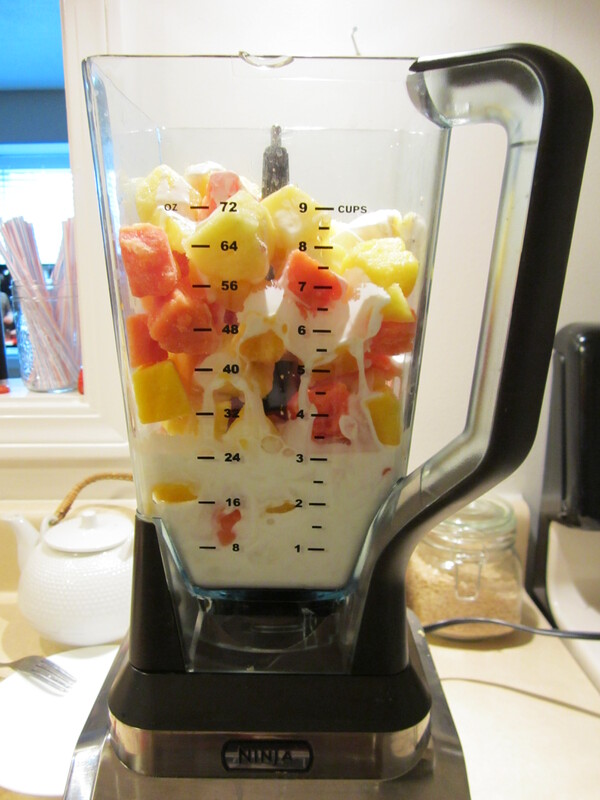 Add all ingredients into your high-powered blender and blend on high until the consistency reaches that of ice cream. You must freeze the fruit thoroughly prior to blending for this recipe to work properly. Thank goodness for this beautiful weather! Now that the rain has stopped (for the most part anyway) I can officially resume walking to work again! I’m so lucky to live in a town where everything is reasonably close together. Just the simple act of walking to work and back adds 5 miles of walking to my day! I love it! My college roommates got married last weekend, so I was out of town to celebrate with them! The wedding was beautiful, and the reception was awesome… Especially the bride and groom’s late night trip to Taco Bell, wedding dress and all! Monday meant back to reality, though, and I was way too wiped to head to the grocery store. I didn’t even have fruit to juice 😦 sad day. I guess it was the perfect time for a little kitchen experimentation! The result was pretty delicious, and I can say I will definitely be making it again! Throw everything but the parsley in a pot and bring to a boil! Simmer for 30 minutes and top with fresh parsley. Voila! 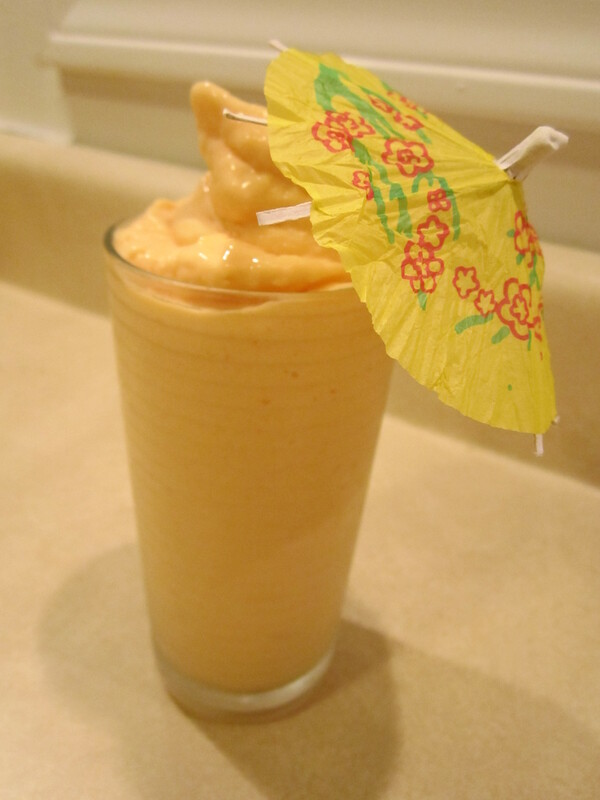 As for the liquid from the can of coconut milk, I threw it into the blender along with a couple frozen bananas and had a very creamy dessert! 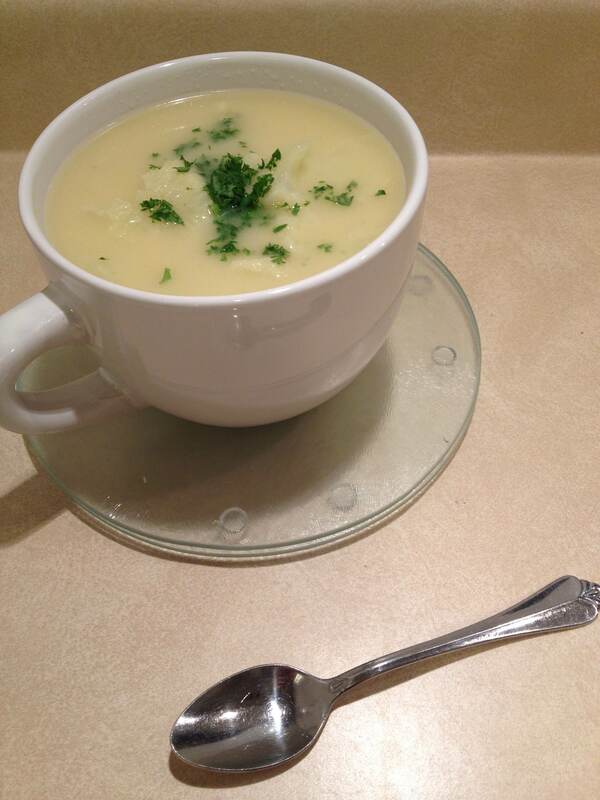 What kinds of healthy meals do you throw together when your cupboards are less than stocked? Enter your email if you wanna see what's new with me and my journey! Plant-Based Chapters + CocoBeet Concoction Juice!